Volvo's latest tease of the redesigned XC90 crossover focuses on the headlights and grille, and evokes the Swedish brand's future and its past. The photo shows a modern LED element in the headlight borrowed from concept vehicles, and a grille with vertical bars that pay homage to Volvos from the 1980s and 1990s. The last cars to feature the chrome double bars were the Dutch-built, Mitsubishi Carisma-based S40 and V40 cars of the late 1990s and the S90 sedans and V90 station wagons of that decade. 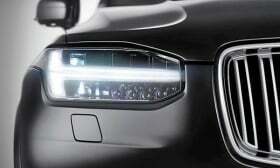 The shape of the headlight, dubbed Thor's Hammer by Volvo designers, follows designs seen on recent Volvo concepts, including the Concept Estate. Volvo also has released photos of the XC90 interior, which will stick with the minimalist, functional approach to dash designs seen in the XC60 and V60. The XC90, which uses Volvo's new Scalable Product Architecture, will be unveiled in Sweden on Aug. 26 and will be displayed in October at the Paris auto show. Volvo will start taking orders for the car in Europe before the end of the year and begin XC90 deliveries in the region in early 2015. North America sales of the SUV are expected to start in spring 2015.